Welcome to the Chez nous page. This section provides a quick snapshot of the complete list of online items so that you can quickly access news items and information on continuing education and other events happening at the MCH. The Fall 2008 Mini-Med sessions have come to a close after more than 225 people of all ages attended the six-week course. Based on written evaluations, an incredible 94% of participants said they would enroll again for future courses. Thanks go to Dr. Melvin Schloss for heading the steering committee and to lecturers Drs. Mark-Anthony Anselmo, Evelyn Constantin, David McGillivray, David Mitchell, Jacquetta Trasler, Nada Jabado, Elena Khalil, Chantal Martel, Thérèse Perreault, and Caroline Quach for their time and interest in bringing our knowledge and expertise to the community. Thanks to funding from the MCH Auxiliary the Family Resource Library (FRL) is now open on Sundays from 10:00 a.m. to 4:00 p.m. The Library, along with the Family Resource Centre, is now open 7 days a week including Monday and Thursday evenings until 8:00 p.m. In addition to the nearly 2,000 books available, the centre has a computer station and toys and games for children. Staff are available to help families throughout the week. 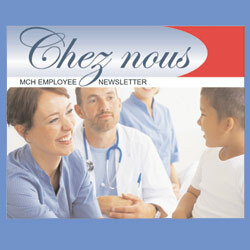 October was another busy month for MCH staff in the media. Dr. Sharon Abish from Oncology did an interview for Télé-Québec’s current affairs show Une pilule, une petit granule. Also, for the same show, Dr. Michael Kramer and Dr. Frances Aboud were interviewed for a January broadcast about their research on the benefits of breastfeeding. Dr. Chris Karatzios from Infectious Diseases was interviewed by Chantal Bessette for an upcoming television broadcast about HIV in children and adolescents. Dr. Marie-Noël Primeau was interviewed by the US magazine Health for an article to be published soon on egg allergies and the flu shot. La Presse published an exclusive front-page interview with Dr. Sam Daniel, ENT surgeon. The article focuses on four-year-old Alyzée Potvin, from Sherbrooke, Quebec, who was born with paralyzed vocal cords which hampered her breathing. During an innovative surgical procedure, Dr. Daniel injected botox in to the child’s neck muscles with amazing results. The child has been removed from a tracheotomy and is now able to talk. The story was subsequently picked up by several other media outlets. A Celebration of the Life of Dr. Michael Davies will be held in the Amphitheatre on Tuesday, November 25 at 12 noon. All are welcome. A memorial service is being organized to remember the children who have died recently at the MCH. We shall also be commemorating children who have died of SIDS. All staff members are warmly invited to attend this service, which will be held on Tuesday November 11th at 2 p.m. in the Amphitheater (D-182). MCH Foundation Annual General Meeting - ad. Mark your agenda for the MUHC Annual General Meeting on Nov. 10 at the MGH. Stay tuned to e-en bref for more details closer to the date. If you are an MUHC employee, immediate family of an MUHC employee or a volunteer, Artstravaganza is your chance to unleash the artist within! This arts and crafts exhibit and sale will be back on November 27 and feature painting, pottery, jewelry, stained glass, and much more! The event will be a feast for the eyes and a chance to discover the talents of our staff. To register, contact Monique Cove  or Annie LeBire  or call 514 554-5216.